Nipponrama is the blog of Michael, a Frenchman living in Tokyo since 2016. He shares his expat experiences and tips in Japan. 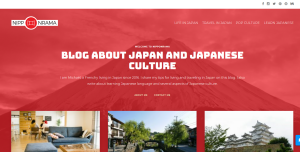 Take a look at this blog if you want to travel or live in Japan. You can also learn the basics of the Japanese language and find out more about Japanese pop culture as J-pop, anime and manga. This blog about Japan is available in several languages, including: English, French, Spanish, Portuguese, Thai, Vietnamese and Indonesian. This what your Nipponrama Blog Ad will look like to visitors! Of course you will want to use keywords and ad targeting to get the most out of your ad campaign! So purchase an ad space today before there all gone! Cet article Owakudani Valley: visit the fumaroles of Hakone est apparu en premier sur Nipponrama. Cet article Sensoji: the famous Buddhist temple in Asakusa, Tokyo est apparu en premier sur Nipponrama. Cet article Find your share house or apartment in Shinjuku, Tokyo est apparu en premier sur Nipponrama. Cet article Find your share house in Nakano, Tokyo est apparu en premier sur Nipponrama. Cet article Find your share house or apartment in Shibuya, Tokyo est apparu en premier sur Nipponrama. Cet article Hotels in Shirakawago: The best ryokans and hostels est apparu en premier sur Nipponrama. If you are the owner of Nipponrama, or someone who enjoys this blog why not upgrade it to a Featured Listing or Permanent Listing?